Those following Dan’s 2011 Mustang GT build know how excited he was to break into the 11’s using only basic bolt-ons. Well, I can tell you firsthand he was equally excited to be working with Raxiom on installing their new GPS unit in his GT. And for good reason, too. Since the install, Dan has been using his new navigation system every day. He’s not using it just for routine travel info either–Dan gets updates on traffic patterns, accidents up ahead and most importantly for Dan and his iron-weighted right foot, updates on where those pesky red light cameras and speed traps are located. After passing on the optional $2300+ navigation unit from the factory, Dan couldn’t be happier with his Raxiom Navigation. This is the perfect upgrade for anyone wanting a more tech-savvy 2010-2014 Mustang without shelling out huge amounts of cash or dealing with a sloppy installation process. 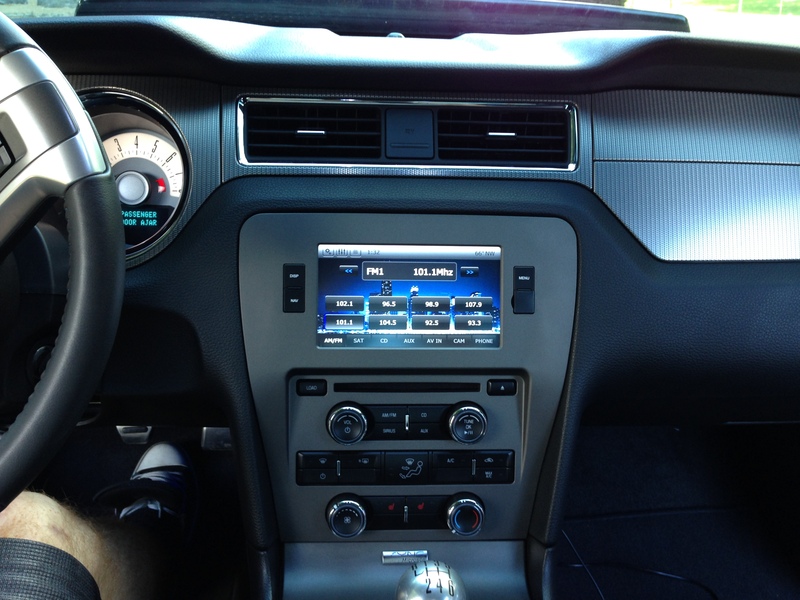 A 7 inch, high-definition touch screen LCD display gives you complete control over your Mustang’s new and existing features, all in full color. Not only does Raxiom’s new GPS navigation keep all of your factory functionality intact, including all voice-controlled SYNC® radio and other SYNC powered features , AM/FM & SAT radio, CD/Ipod audio and the bluetooth hands-free system, you also are in control of your new back-up camera and iGO Primo powered user dashboard. iGo Primo 2.0 is the spftware that power’s Raxiom’s GPS navigation and includes text-to-speech, voice and visual turn-by-turn on screen, 2D, 3D, and green routing directions and 3D building views for major cities. Five languages–English, Spanish, Mandarin Chinese, Japanese and Korean–are available with your choice of a male or female’s voice (that’s right, you can choose your Mustang’s gender!). The real beauty in Raxiom’s new navigation is that it looks exactly like a factory option, without the factory price tag. The unit installs flawlessly in 2010+ Mustangs** and you’ll be the only one to know it’s not a factory installed piece. In two hours or less, you can have this fully functioning touch screen navigation installed. The kit comes with the navigation unit itself as well as the surrounding trim, back-up camera, head unit with steering wheel control harness and the needed RCA cables–everything you’ll need for install. 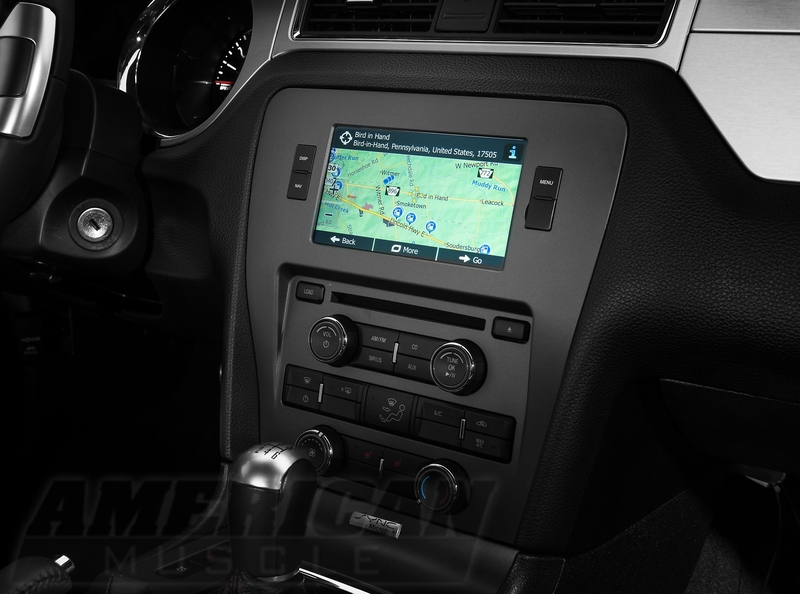 ** Fitment: Raxiom’s GPS navigational head unit fits ALL 2010+ Mustangs (including V6, GT, BOSS and Shelby GT500 models) EXCEPT 2010 Mustangs with 6-disc changers! Does this unit come with map update support? If so, are they life? This unit requires your mustang to have SYNC. This is a real epic fail as more than half the mustangs on the road don’t have SYNC. Raxiom lost me as a customer for this reason, and I suspect they lost many others as a result. Good call, Patrick. Still 10 months since you’ve posted and we still don’t have a non-Sync option. How expensive/difficult could this build be?! Can i uploadr brazil’s map? Gotta agree with Patrick, here. It leaves those of us with the base car high and dry. Bluetooth functionality is NOT expensive or space-intensive, dudes. Why can’t we make that an option? When it will be back in stock ???? When will it be back in stock ?? ?